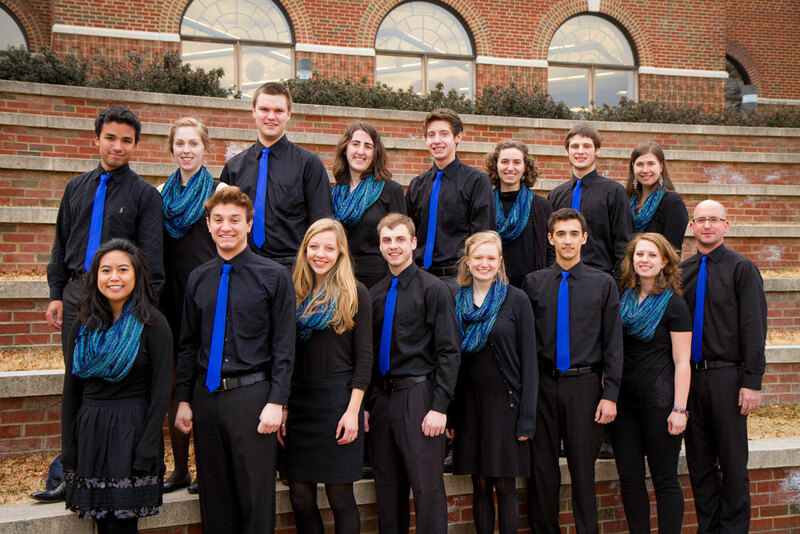 Emulate, a new elite vocal ensemble from Eastern Mennonite University, will travel to Pennsylvania for a four-day “Spring Break Tour” March 5-8. In addition to four concerts at area churches, the group will perform at chapel and provide workshops in music classes at Lancaster Mennonite School. The 16-member group, led by assistant professor of music Ryan Keebaugh, specializes in madrigals, jazz, and modern and contemporary concert literature, both secular and sacred. The son of an organist and a Brethren minister, Keebaugh is an experienced choir director and a widely traveled and oft-performed composer. He earned his DMA at The Catholic University of America, and was previously choral director at Mary Baldwin College and director of choral activities at Clarke County High School. Paying tribute to musical roots, Keebaugh noted that Emulate includes nine graduates and former participants of two strong high school music programs. Junior Jeffrey Smoker, a business major who sings bass, is an experienced choral performer, having toured while at Eastern Mennonite High School (EMHS) and Hesston College. Fellow EMHS graduates in the group include Hannah Shultz, Caitlin Holsapple, Michaela Mast, Eli Wenger and Perry Blosser. Local ties make this tour especially appealing, said senior Erin Hershey, who is among six Pennsylvania natives in the group. She and junior Luisa Miller are members of Slate Hill Mennonite Church, which hosts Emulate on March 5. Rounding out the group are Heather Evans, of Alexandria, Virginia; Mischa De Jesus, of Kalona, Iowa; Jake Rhine, of Indianapolis, Indiana; Guilio Garner, of Harrisonburg, Virginia; and Nathaneal Ressler, of Mount Vernon, Illinois. The Pennsylvania tour is a prelude to a longer two-week tour this summer through the midwest, with final performances at the Mennonite Church USA Convention June 30-July 5 in Kansas City, Missouri. Will there be a recording of this available to purchase? Can you please post a selection to listen to as a sample? Thank-you.